A bottle which is filled too high (less than 1/2" of head space) may gush when opened. A bottle which was filled too low (more than 1-1/2" of head space) may go bad prematurely due to oxidation. 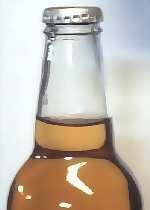 The cause for either a high or low fill is an improper bottling technique. Try to keep the temperature of the bottles close to the temperature of the wort to prevent excessive foaming when filling. Practice...practice...practice! If you are still getting inconsistent fills after many batches, you may want to try using a different bottle filler.